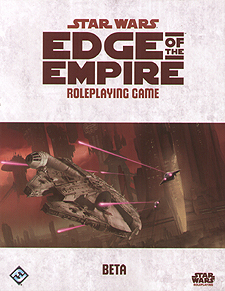 This, the first Star Wars RPG release from Fantasy Flight Games, may surprise some with its focus. Rather than attempting to cover the Star Wars prequels this book goes back to 'classic' Star Wars, the setting and time period around the very first Star Wars movie. It has a focus on smugglers, explorers, bounty hunters and those other individuals living on the edge of known space. The book is well laid out, text is crisp and clear and for a beta product there are surprisingly few typos. Some rules are in flux but FFG have so far released weekly rule updates on their website. The final release of the book will apparently feature more art and more 'fluff' text. This is a fair call for a beta release, as it is more important to get the rule mechanics right first. There are some Force rules in the book, not many but enough to get by. Games Masters should be able to extend what is in the book themselves if they need to. Some may dislike waiting for a later book to play a Jedi Knight, but for those who played the original West End Games Star Wars RPG, this beta release shows great promise and their focus on the original trilogy is commendable.